I loved, Loved, LOVED ‘Now You See Me‘! I’ve been ecstatic about the sequel for so long and am thrilled I can share the trailer with everyone. Of course, one of my favorite things about the first film was the inclusion of Isla Fisher, alas her pregnancy got in the way of production this time around and Lizzy Kaplan (‘Mean Girls’) stepped in to fill that void. She’s by no means the only new blood the film is seeing, Daniel Radcliffe joined the cast and the end result, at least the trailer, is phenomenal! One year after outwitting the FBI and winning the public’s adulation with their Robin Hood-style magic spectacles, The Four Horsemen resurface for a comeback performance in hopes of exposing the unethical practices of a tech magnate. The man behind their vanishing act is none other than Walter Mabry, a tech prodigy who threatens the Horsemen into pulling off their most impossible heist yet. Their only hope is to perform one last unprecedented stunt to clear their names and reveal the mastermind behind it all. 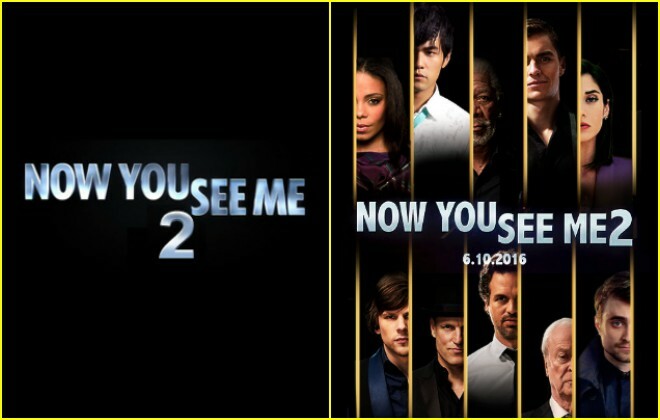 ‘Now You See Me 2’ bows June 10 of this year. This entry was posted on Wednesday, March 16th, 2016 at 5:10 pm	and is filed under Film, News. You can follow any responses to this entry through the RSS 2.0 feed. You can skip to the end and leave a response. Pinging is currently not allowed. « The Trailer For ‘Ben-Hur’ Is Action-Packed!! !